The Fort Worth Civil War Round Table just announced the 2018 recipient of the A. M. Pate, Jr. Award and congratulations are in order to Christopher Grasso for his winning book Bloody Engagements: John R. Kelso's Civil War (Yale, 2017). 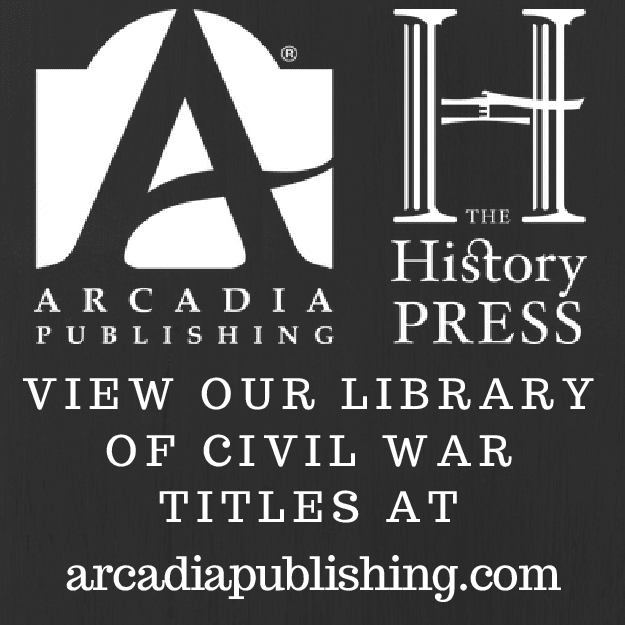 The honor, the only purely Trans-Mississippi Civil War book award, is handed out on a yearly basis but candidates from the previous twenty-four months are considered (a probably wise state of affairs given that some years, like 2018, can be quite thin ones when it comes to T-M publications). The Kelso material is an exceptional Civil War Missouri memoir and Grasso demonstrated a good eye in seeing its value and did very fine work editing it for publication. Let's hope there will be even more to come during the rest of the year. 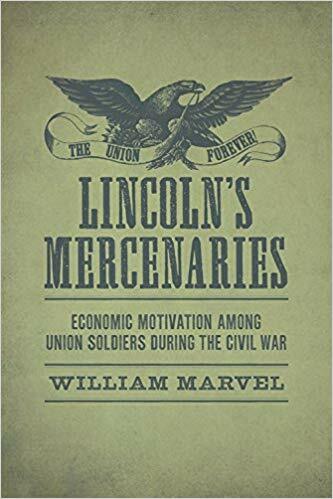 • Lincoln's Mercenaries: Economic Motivation Among Union Soldiers During the Civil War by William Marvel (LSU). • The Real Horse Soldiers: Benjamin Grierson’s Epic 1863 Civil War Raid Through Mississippi by Timothy Smith (Savas Beatie). • A Campaign of Giants - The Battle for Petersburg, Volume 1: From the Crossing of the James to the Crater by A. Wilson Greene (UNC). • Fighting Means Killing: Civil War Soldiers and the Nature of Combat by Jonathan M. Steplyk (Kansas). • "Our Little Monitor": The Greatest Invention of the Civil War by Anna Gibson Holloway and Jonathan W. White (Kent St). • Contested Loyalty: Debates over Patriotism in the Civil War North edited by Robert M. Sandow (Fordham). • War Matters: Material Culture in the Civil War Era edited by Joan E. Cashin (UNC). • At the Forefront of Lee's Invasion: Retribution, Plunder, and Clashing Cultures on Richard S. Ewell's Road to Gettysburg by Robert Wynstra (Kent St). • In the Wake of War: Military Occupation, Emancipation, and Civil War America by Andrew F. Lang (LSU). • Mountain Feds: Arkansas Unionists and the Peace Society by James J. Johnston (Butler Ctr). • Engines of Rebellion: Confederate Ironclads and Steam Engineering in the American Civil War by Saxon T. Bisbee (Alabama). • On Duty in the Pacific Northwest during the Civil War: Correspondence and Reminiscences of the First Oregon Cavalry Regiment edited by James Robbins Jewell (Tennessee). • Upon the Fields of Battle: Essays on the Military History of America's Civil War edited by Andrew S. Bledsoe and Andrew F. Lang (LSU). • "An Arch Rebel Like Myself": Dan Showalter and the Civil War in California and Texas by Gene C. Armistead and Robert D. Arconti (McFarland). • The Diaries of Reuben Smith, Kansas Settler and Civil War Soldier edited by Lana Wirt Myers (Kansas). • A Forgotten Front: Florida during the Civil War Era edited by Seth A. Weitz and Jonathan C. Sheppard (Alabama). • Kirk's Civil War Raids Along the Blue Ridge by Michael C. Hardy (Arcadia & Hist Pr). • Rethinking the Civil War Era: Directions for Research by Paul D. Escott (Kentucky). • The Battle of Ball's Bluff: All the Drowned Soldiers by Bill Howard (Arcadia & Hist Pr). • Attacked On All Sides: The Civil War Battle of Decatur, Georgia, the Untold Story of the Battle of Atlanta by David Allison (Author). • Decisions at Stones River: The Sixteen Critical Decisions That Defined the Battle by Matt Spruill & Lee Spruill (Tennessee). Back when most publishers expressed little interest in military and civilian letters, diaries, and memoirs exclusive to the Civil War west of the Mississippi, Camp Pope Publishing (formerly The Press of the Camp Pope Bookshop) was quietly building a reputation as the premier publisher and purveyor of such things. And the press (or rather talented jack of all trades owner-proprietor Clark Kenyon) is still going strong. The latest CPP release is the newly available Thomas W. Knox: Civil War Correspondent in Missouri, edited by Robert G. Schultz. See the link above for more information. From the description: "By the beginning of the Civil War, the New York Herald, founded in 1835, had become one of the largest and most influential newspapers in the country. The Herald sent correspondents throughout the North to report on the war. Among them, Thomas W. Knox was assigned to report on the war in Missouri, based in St. Louis. In the early days of the war, there was much action to report on in Missouri. Knox was an ideal choice for this assignment and had a particular talent and perception for his assignment. He was able to be close to the Union leaders as they struggled to build a war machine to cope with secessionists in their midst and, at the same time, he was able to tell human interest stories about ordinary people and the effect of the war on them. He accompanied many of the expeditions and filed first-hand reports on the scenery, movements, and actions. These are his reports as they appeared in the New York Herald. They offer a different, more extensive view than that usually seen in books on the early part of the war in Missouri." Anyone with a deep interest in the early-war period in Missouri is familiar with Knox's valuable firsthand perspectives on people and events, but I'm sure many readers are also like me in not having read all of his articles and reports in full. At nearly 600 pages this is a huge collection of Knox war reportage, and I can't wait to jump right in when my copy of the book arrives. I'm curious to see what Schultz did with the material in terms of notes, editing, and commentary as well. I know this is a downer amidst the season of joy, but it's also a time to give thanks for the good people in our lives and I just wanted to say a few words about the recent passing of a person who meant a lot of me over the years. I'd known for quite some time that Jim McGhee, one of those individuals who was a lawyer by profession and Civil War historian by the grace of God, was in declining health. I feared the worst when my last email to him went unanswered and learned from his wife last week that he'd passed away back in November. I don't recall our very first conversation, but Jim and I corresponded over our shared interests in all things Civil War Missouri on a semi-regular basis for what was probably fifteen years or more. John Waugh's biography of Ed Bearss is titled "History's Pied Piper," and I personally regard Jim in the same manner when it comes to promoting Missouri's Civil War. Jim authored numerous books and articles that made him a major figure in the modern chronicling of Missouri's Civil War history. 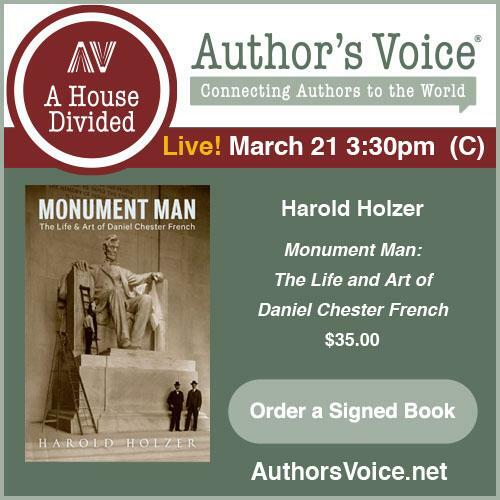 His edited works put many obscure firsthand accounts and other primary source materials in the hands of readers for the first time. Many of his titles were put out in tiny print runs through now-defunct regional publishers, so you'll have to employ great effort in seeking them out yourself because they will never find you on their own. An acknowledged expert on the Missouri State Guard and Missouri's Confederate soldiers, Jim's co-authorship (and it was more than that) of Sterling Price's Lieutenants (Two Trails Pub, rev. 2007) and his creation of the equally indispensable Guide to Missouri Confederate Units, 1861-1865 (Univ of Ark Press, 2008) are arguably his two greatest contributions. But he was also very generous when it came to sharing his knowledge and research with others. Jim helped me enormously on more occasions than I can count, and if you read any book that touches upon Civil War Missouri you'll more than likely find Jim's name prominently mentioned in the acknowledgments section. Stubbornly unwarranted modesty about his writing ability probably kept Jim from publishing even more. For example, even though I thought it publishable with very few needed changes, I couldn't convince him to convert his excellent master's thesis on the MSG's First Division (M. Jeff Thompson's outfit that operated in the Bootheel of Missouri) into a book. Rereading our 2008 CWBA interview just now [you can find it here], I also realized that I had completely forgotten about (and he never mentioned it since) his unfinished "A Missouri State Guard Reader" project. We'll just treasure what we do have, and it's indeed a great deal. 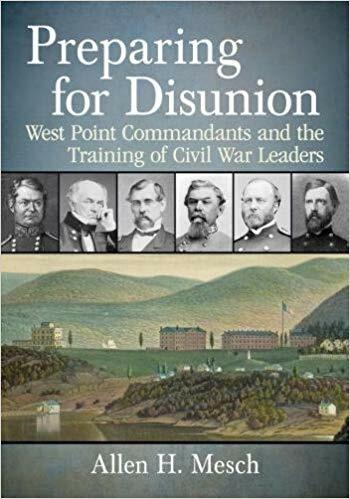 • Preparing for Disunion: West Point Commandants and the Training of Civil War Leaders by Allen H. Mesch (McFarland, 2018). Though I'm certainly not privy to the inner workings of West Point, it might be a reasonable guess to suggest that antebellum commandants had more opportunities to personally shape the education and training of the U.S. Army's professional elite than the institution heads of following eras. If that's indeed true, it would make Allen Mesch's Preparing for Disunion: West Point Commandants and the Training of Civil War Leaders even more illuminating to read and contemplate. From the description: "Between 1817 and 1864, sixteen officers were assigned as Commandants of Cadets at the U.S. Military Academy. They played an important role in training the officers who would serve on both sides of the Civil War. Historians criticize the program as antiquated for its time: A course in Napoleonic strategy and tactics that did not account for rifled weapons or the particularities of terrain. Yet these commandants made changes to the program, developed new textbooks and instructed cadets who became field generals. The biographies of the commandants are presented along with their contributions to the Academy, notable graduates and other military service." In case you're wondering, the sixteen officers that held the post over that time are George W. Gardiner, John Bliss, John R. Bell, William J. Worth, Ethan A. Hitchcock, John Fowle, Charles F. Smith, John A. Thomas, Bradford R. Alden, Robert S. Garnett, William H.T. Walker, William J. Hardee, John F. Reynolds, Christopher C. Augur, Kenner Garrard, and Henry B. Clitz. In addition to exploring the common duties of the West Point commandant during the early to mid 19th century period under consideration and presenting biographical sketches and a direct contributions discussion for each officer listed above, the book is packed with lists, charts, and tables. The appendix section goes into some depth on the antebellum graduating classes, with particular attention paid to those officers that would serve in the Civil War. Looks interesting. Review - "High Private: The Trans-Mississippi Correspondence of Humorist R. R. Gilbert, 1862–1865" by Mary Cronin, ed. Rensselaer Reed Gilbert, a northern-born wartime humorist and reporter from Texas who wrote under the pen name High Private, was never as famous as Charles F. Brown's creation Artemus Ward, or Charles Henry Smith's Bill Arp, or David Locke's Petroleum V. Nasby, but he was a well-known "literary comedian" to citizens of the Confederate Trans-Mississippi. It's probably safe to say that the great majority of today's Civil War readers, including most serious students of the Civil War west of the Mississippi, have either never heard of him or have forgotten about him if they ever did. Details about Gilbert's personal life and his Vermont (some have said New York) upbringing remain sparse, but editor Mary Cronin makes good use of what information is available and builds significantly upon her earlier published work on Gilbert in her new book High Private: The Trans-Mississippi Correspondence of Humorist R. R. Gilbert, 1862–1865. The volume possesses significant biographical elements, but most of it consists of Cronin's edited compilation of a select but large body of Gilbert's newspaper writings (supplemented by a handful of revised war reminiscences originally published in the two early 1890s editions of Gilbert's Confederate Letters collection). R.R. Gilbert had some apprentice medical training before the war but practiced little and instead attempted throughout his life to make a living in newspaper publication. Never a smashing pecuniary success at anything he tried, he lived a rather nomadic existence, starting a paper in one town only to soon either lose or sell the business before moving to another Texas community with his family to begin anew. A wag critic at the time suggested that Gilbert intended to fail at newspaper editorship in every town and city in the state. Given that Gilbert was born and raised in a state that was as Yankee as one could find, an obvious question arises as to the source(s) of his seemingly wholesale adoption of southern culture, racial views, and radical pro-secession ideology. While Gilbert's conversion was far from an isolated case in antebellum America, it remains unfortunate that his innermost personal thoughts were not something he put to page (or if he did so privately such papers have either never been found or no longer exist). When his adopted state of Texas left the Union, Gilbert became an ardent Confederate nationalist and keen supporter of the war. Enlisting in Company B of the 6th Texas Volunteer Infantry Regiment, he frequently wrote to his home newspaper about his army experiences but never saw action before leaving the service to become a paid correspondent for the Houston Tri-Weekly Telegraph. Articles pertaining to his brief military service are generally limited in scope to remarks on camp life, drilling, training, and the government's inability to adequately arm and equip the men. When medically discharged in 1862 Gilbert was already past forty, much older than the typical Civil War private soldier. Readers looking for detailed firsthand observations of Trans-Mississippi theater campaigns and battles won't find anything like that in his newspaper articles. Though Gilbert traveled some distances toward the front (ex. to Camden, Arkansas and Alexandria, Louisiana) to be near the most prominent generals in the department's military high command—particularly major generals John B. Magruder, Edmund Kirby Smith, and Richard Taylor—he was not a war correspondent in the traditional sense of accompanying the armies in the field. If he met and conversed with any of those high-ranking generals in person, he unfortunately did not record his impressions. Instead, Gilbert served his readers more in the capacity of news conduit between Texas and points east, an increasingly important job as the Trans-Mississippi became progressively isolated from the rest of the Confederacy beginning in 1863. Striving to convey news that was as accurate as possible, Gilbert actively canvassed Arkansas and Louisiana citizens for copies of cis-Mississippi newspapers of any origin, and he frequently chastised in print those owners reluctant to let him borrow them. Not really a purveyor of detailed military news (though he did very frequently integrate hard news of various kinds into his writing), Gilbert's correspondence seems to have been primarily aimed at entertaining the home audience and boosting their morale after the war turned sour. He also certainly wasn't shy about creating shrill anti-Yankee propaganda for local consumption. He leveraged his northern background to both lend credibility to his propaganda and warn his fellow citizens that northerners would fight and fight very well. Alternately whimsical and bitingly critical, Gilbert's humor almost always employed creative wordplay and puns, and he used a number of recognizable rhetorical devices that Cronin discusses in the second chapter. Much of the time, Gilbert's articles combined humor and news (usually in that order) but also wrote many pieces that were entirely news, editorial, or comic sketch. His comedy was expressed in many different forms, too, among them songs, poetry, mock speeches, and the like. As mentioned above, Gilbert could wield a sharp pen against friend and enemy alike. One rather expects to see exaggerated portraits of villainy when it comes to enemy soldiers and controversial northern generals like Ben Butler, but Gilbert also repeatedly criticized Confederate authorities for not paying the soldiers on time (or at all) and not supplying them properly. He also chastised civilians for war profiteering and shirking (the slow filling of ranks in the 6th being one factor behind why Gilbert saw no action during his brief army service). While humor proved to be a useful tool for relieving civilian stress amid the mounting pressures, worries, and privations of war, it also to some degree shielded critical yet loyal voices like Gilbert's from strong public and official reproach. While Gilbert's wartime writing clearly demonstrates a deeply felt Confederate nationalism, his postwar correspondence indicates that he was also a highly pragmatic realist. Though undoubtedly rendered distraught by defeat and troubled by military occupation, he rather quickly accepted the new world he was confronted with and counseled other Texans to do the same. Rather than urging resistance, Gilbert lent his efforts fully toward promoting Texas's economic recovery and growth. What didn't change were his views on race. Feeling that freedpeople could never contribute to Texas's rebirth, Gilbert actively sought mass immigration from Europe to fulfill the state's labor and development needs. Cronin, a journalism professor, does a fine job of adding historical and rhetorical context to Gilbert's life, writing content and style, and professional activities. She achieves this through two excellent introductory chapters, informative annotation, and careful selection of material. As mentioned before, not all of Gilbert's prodigious literary output is included in the book. Readers with a special interest in Civil War Houston might have benefited from the inclusion of Gilbert's "City Items" columns, but those are available online elsewhere. The work of R.R. 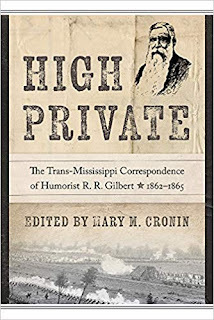 Gilbert is richly deserving of the kind of reintroduction to modern readers that editor Mary Cronin provides so well, and the anthologized content and associated scholarship contained in High Private represents an important contribution to the study of war reporting in the Trans-Mississippi. 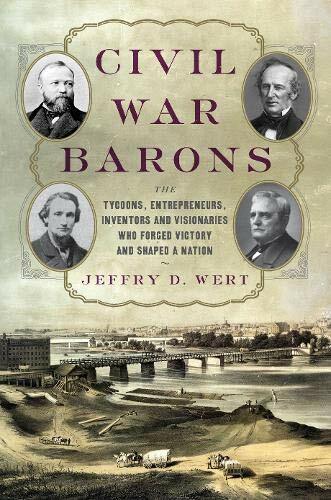 • Civil War Barons: The Tycoons, Entrepreneurs, Inventors, and Visionaries Who Forged Victory and Shaped a Nation by Jeffry D. Wert (Da Capo, 2018). Jeffry Wert's Civil War Barons examines the lives and work of a number of northern creators and innovators who together made Union victory even more likely than it already was. "The Civil War woke a sleeping giant in America, creating unprecedented industrial growth that not only supported the struggle but reshaped the nation. Energized by the country's dormant potential and wealth of natural resources, individuals of vision, organizational talent, and capital took advantage of the opportunity that war provided. Their innovations sustained Union troops, affected military strategy and tactics, and made the killing fields even deadlier." Books like this are typically organized as a series of chapters, each devoted to a single individual. Wert's study instead adopts a more thematic approach with the stories of two of more "barons" examined in every chapter but one. With chapter headings of The Administrators, The Visionary, The Inventors, The Improvisers, The Patriots, The Investors, The Tinkerers, The Dreamers, The Opportunists, and The Builders, the variety of contributions addressed across society and industry is broad indeed. The author also does a fine job of mixing famous men with those that were well known in their own time but comparatively obscure historical figures to today's readers. So for every Jay Cooke, Cyrus McCormick, and Cornelius Vanderbilt, there's a Gordon McKay, Abram Hewitt, and Henry Burden. As one might expect from Wert, his writing in Barons is stylistically easy going but backed by serious research. More from the description: "Individually, these men came to dominate industry and amass great wealth and power; collectively, they helped save the Union and refashion the economic fabric of a nation. Utilizing extensive research in manuscript collections, company records, and contemporary newspapers, historian Jeffry D. Wert casts a revealing light on the individuals most responsible for bringing the United States into the modern age." • Clara Barton's Civil War: Between Bullet and Hospital by Donald C. Pfanz (Westholme, 2018). Apart from those who mix her up with Britain's Florence Nightingale, Clara Barton has to be the most recognized name in the history of American military nursing. Interested in the Civil War or not, everyone has at least heard of her. 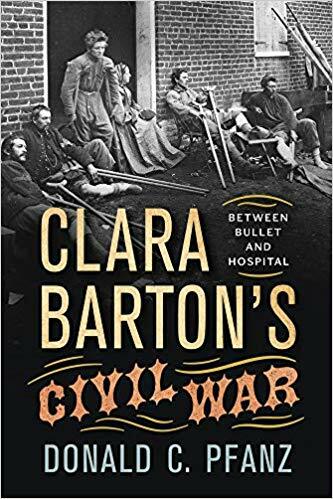 Attempting to separate truth from legend, Donald Pfanz's Clara Barton's Civil War: Between Bullet and Hospital represents a fresh reappraisal of her wartime service. Barton "served in at least four Union armies, providing food and assistance to wounded soldiers on battlefields stretching from Maryland to South Carolina. Thousands of soldiers benefited from her actions, and she is unquestionably an American heroine." Like most individuals who survive and thrive in the national consciousness long after their passing, Barton had great PR, much of it created by herself. From the description: "Most information about Barton’s activities comes from Barton herself. After the war, she toured the country recounting her wartime experiences to overflowing audiences. In vivid language, she described crossing the Rappahannock River under fire to succor wounded Union soldiers at Fredericksburg, transporting critical supplies to field hospitals at Antietam, and enduring searing heat and brackish water on the sun-scorched beaches of South Carolina. She willingly braved hardship and danger in order to help the young men under her care, receiving in return their love and respect. Most of Barton’s biographers have accepted her statements at face value, but in doing so, they stand on shaky ground, for Barton was a relentless self-promoter and often embellished her stories in an effort to enhance her accomplishments." In the book, Pfanz "revisits Barton’s claims, comparing the information in her speeches with contemporary documents, including Barton’s own wartime diary and letters. In doing so, he provides the first balanced and accurate account of her wartime service—a service that in the end needed no exaggeration." Every once in a blue moon I get a note from the author of a reviewed title. Last week, A. Wilson Greene nicely emailed me about an issue he had with my highly positive review of his most recent book A Campaign of Giants - The Battle for Petersburg, Volume 1: From the Crossing of the James to the Crater (2018) and with how I encapsulated his views on Meade in a later interview with Meade biographer John Selby. It turns out that my summary characterization of Greene's views on Meade at Petersburg are not exactly in line with the author's true feelings or intentions. Indeed, they are much opposed. I always welcome comments from anyone about the reviews on the site, so I invited him to leave a comment on the review page or better yet put together a rebuttal of sorts that I could publish as a standalone post where more people would see it. Not getting a response either way, I think my obligation ends there but I'm not really comfortable leaving it at that. Many readers tend to want to box authors and biographers into pro and anti camps, and I didn't want to have my review construed by anyone in the opposite way that the author intended. That said, I stand by everything that I wrote in the review (which was published eight months ago), as it represents my honest impression of the accumulated arguments presented in the book. So, what can I say? I'm not going to block quote from a private email, but I think I can appropriately try to encapsulate Greene's objections. Apparently, my impression that Meade had outlived his usefulness as an effective army commander by the end of the period covered in the book is not at all the view that Greene wanted to convey. He doesn't see any of the failures and mistakes committed during the initial offensives as singularly attached to Meade but rather liberally shared among the rest of the theater's high command. Greene by no means self-describes himself as a Meade "detractor." I think that's a good overview of what he shared with me, and I'll link to this on both the original book review and the Selby interview. When regular army troops stationed in the Far West departed to points east at the outbreak of the Civil War, it was largely California volunteers that picked up the slack. Garrisoning key posts and keeping tabs on both internal dissent and potentially hostile tribes, they ranged all across the West's vast expanses, including the Pacific Northwest. Published primary source accounts of their service in the region are few, and by far the best-known is Royal Bensell's edited journal All Quiet on the Yamhill: The Civil War in Oregon (1959). But Oregon raised troops of their own, too, and James Robbins Jewell's new collection of wartime letters written by Oregon volunteers titled On Duty in the Pacific Northwest during the Civil War: Correspondence and Reminiscences of the First Oregon Cavalry Regiment is now available as part of UT Press's classic Voices of the Civil War series. From the description: "From 1862 to 1865, twenty-six hundred miles away from the seat of the federal government in Washington, DC, the First Oregon Volunteer Cavalry Regiment offered aid to the Union cause in the American Civil War. The First Oregon Cavalry confronted a host of complex challenges unseen by their counterparts serving in a more traditional role in the East. Their battles were more often with Native Americans—and often more concerned with their own status in the territory than with the Civil War rending the nation—while searching for pro Confederate spies and sympathizers. However unsung during the war, the regiment carried out their responsibilities successfully, managing to expedite the development of the Pacific Northwest in the process." Jewell's edited collection also represents the closest thing we currently have to a 1st Oregon regimental study. "Complete with a series of reminiscences and excerpts from memoirs by First Oregon Cavalry officers and soldiers, On Duty in the Pacific Northwest during the Civil War is the first collection of primary source materials from soldiers serving in this Far Western territory. Jewell’s first-rate collection enables readers to step directly into the Pacific Northwest of the early 1860s and experience the Civil War from a different perspective." I've been waiting all year to get my hands on this title, and it looks great. Expect a review fairly soon. The question of whether the American Civil War was a limited conflict still connected to Enlightenment ideals of military restraint and non-targeting of civilians or was an early version of modern total war remains much debated today. Less concerned with weighing in one way or another on that particular issue, Aaron Sheehan-Dean's The Calculus of Violence: How Americans Fought the Civil War is primarily interested in examining the modulating interaction that existed between the many social, military, and political factors that exacerbated Civil War violence and the range of enemy responses that deescalated those very same volatile situations that threatened to spiral out of control. 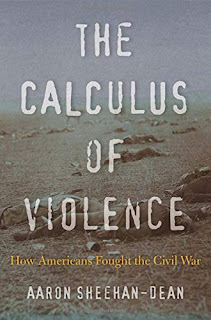 According to the author, in this 'calculus of violence' moral and physical restraint ultimately won out, but not without considerable stretching and violations of the rules of war by both sides. For some time now, cracks have regularly appeared in the traditional interpretation that Civil War violence and destruction increased along a linear path, with mid-1862 being the tipping point between abandonment of limited war (or conciliatory) objectives and the earnest application of hard war. Sheehan-Dean agrees with those that have more recently argued that hard war style human violence and property destruction existed from the very beginning of the conflict. His alternative characterization of escalating violence as unevenly distributed (in both human and geographical terms) and progressing in fits and starts with periodic pull back (even during the latter years of the war when most assume peak violence to have occurred) much better fits the collective impression gained from the widest reading of the current literature. Clay Mountcastle and Daniel Sutherland, both astute and influential scholars of the irregular Civil War, would certainly approve of Sheehan-Dean's assigning guerrilla warfare a prominent role in the amplification of Civil War violence. In the author's view, the Confederate government's early acceptance and even encouragement (or at least lack of active discouragement) of guerrilla warfare doomed vast areas of the South and Border States to lawlessness and exposed civilians (guilty and innocent alike) to harsh and frequently disproportionate Union reprisal measures. But it could have been much worse, and the author persuasively credits federal retaliation policies, or just the threat of same, for providing a reasonably effective braking mechanism to the violence. Banishment, imprisonment, bond & oath taking requirements, and other non-lethal measures were also employed to effect, particularly in the breaking up of guerrilla support networks. The personalized nature of guerrilla violence created intense emotions and desires for revenge, and it is also perceptively noted in the book that institutional procedures and the non-instantaneous nature of nineteenth century communications created delays in response that usefully doubled as cooling off periods. As the study shows, both sides attempted to use various moral and legal considerations to elevate the justness of their own cause and diminish the enemy's, while at the same time ignoring their own excesses and ethical failings (often for same or similar offenses). Guerrilla warfare can serve as a good example of this. It is somewhat unfortunate that the author characterizes the war's guerrilla conflict as distinctly Confederate when in truth pro-Union (or anti-Confederate) guerrillas operated in contested areas with similarly muted official opposition. During the war, many Union commanders sanctioned irregular forces whose actions closely mirrored those so vehemently condemned when committed by the enemy. Placing such a strong degree of blame for the guerrilla crisis on Confederate government officials also seems only partially valid, as many of the worst actors operated in areas outside of the Confederacy itself (ex. in Missouri and Kentucky) or committed depredations in enemy occupied or isolated places beyond practical reach. In a true people's contest, as the American Civil War arguably was, it would be hard to imagine guerrilla warfare not arising within occupied rear areas or isolated districts regardless of official government policy. One of the primary reasons individuals joined guerrilla outfits was to avoid being placed under any kind of regimented control, and it is unlikely that such men would have listened to any edicts from far off Richmond or feared suppression from a vastly overstretched Confederate Army. Rather than just critiquing the Partisan Ranger Act of 1862 on the grounds of how the law sanctioned and promoted a highly inadvisable, illegal, and unjust mode of warfare while also cynically providing legal cover for those same bad actors, one might reasonably also see it as a good faith (if tragically naive) attempt to exert governmental order and regulatory oversight over a problem already getting out of hand. The book also fails to mention that the Act was repealed by the Confederate Congress in February 1864. 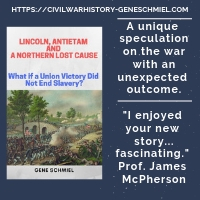 Emancipation, the Union Army's employment of black troops (the vast majority of whom were freed slaves), and the Confederate response to those decisions all joined guerrilla warfare as factors that significantly exacerbated the scale and intensity of Civil War violence. Like the guerrilla war, large-scale black enlistment directly contributed to heated debates within and between the warring sections over who could decide the status of lawful vs. unlawful combatants. In retrospect, it seems inevitable that widespread abuses and unlawful killings would occur when Confederate troops inculcated with servile insurrection fears encountered black soldiers assumed to have been placed into Union ranks for the very purpose of sparking mass slave uprisings and race war. From the Confederate perspective, these men were illegitimate enemies not subject to treatment under the laws of war. However, Sheehan-Dean sees this argument of inevitability as a false assumption, and cites several international examples of colonial armies putting ex-slaves in their ranks to fight against their former masters, acts that apparently did not produce violent objections of the kind seen during the American Civil War. Unfortunately, not enough contextual details are presented to properly assess the appropriateness of the comparison. Regardless, Union retaliatory measures, both real and threatened, helped ensure that black flag warfare would not be the rule whenever Confederate troops encountered black Union regiments on the battlefield, though unlawful mistreatment of black POWs continued to be routine. Violent slave rebellion easily had the greatest potential to comprehensibly devastate the South and result in civilian casualty levels similar to those produced by contemporary Civil Wars like the Taiping Rebellion in China. That nothing of the kind occurred during the American Civil War came as a true surprise to the strongest critics, north and south, of emancipation and black enlistment. Like other scholars, Sheehan-Dean sees slaves as having been more concerned with gaining freedom than revenge. He also concurs with the view that the tenets of Christianity instilled into slaves over generations very likely had a restraining effect. Discussed here are just some of the most significant ingredients to Civil War violence's toxic brew. Of the remaining factors discussed at some length in the book, one of the most interesting is the author's positive assessment of the role of the nation-state. Rightly and wrongly, the reputation of the modern nation-state and the nationalism associated with it took a severe hit in the aftermath of the bloodbaths of the twentieth century. However, Sheehan-Dean convincingly argues that the construct of the nation-state and all the idealized aspirations that went with it (including a desire for acceptance in the international community of nations) had salutary restraining effects on both sides during the American Civil War. Though lacking formal recognition, it's undeniable that the Confederacy created a functioning democratic nation-state in the midst of war, which was an unusual achievement for the rebelling side in historical civil conflicts of similar scale. Attaining the status of an internationally recognized and respected nation-state was important to both sides, and democratic nationhood's institutional checks and balances, accountable law and order systems, open lines of communication, and desire to appear morally upright in the eyes of the rest of the world all combined to restrain the kinds of ultraviolent excesses typically seen during civil wars. It should also be mentioned that the author is clearly not ingenuous when it comes to assessing the laws of war and their positive restraining effects. He certainly recognizes that the laws of war were often bent and manipulated by each side, both to justify their own questionable conduct and to attempt to restrict the enemy's employment of tools and tactics of proven use against them. Moral malleability also occurred hand in hand with self-serving legal and political machinations. One of the best examples provided in the book is the war's transformation of much of the North's pacifist abolitionist element into one of the conflict's most radical proponents of unrestrained violence against enemy combatants and civilians. In presenting the material, Sheehan-Dean does a fine job of melding his own research with a well-selected synthesis of the best existing scholarship. With some notable exceptions (for example, his insistence that the bombing of the military depot at City Point by Confederate saboteurs represented one of the war's worst atrocities), the author generally avoids channeling readers toward starkly black and white conclusions, instead inviting them to pass their own judgment. One might argue that he applies the just vs. unjust label a bit too freely in the book, but it cannot be expected that authors to be equivocal on everything, nor should they be. It is popular to say that in war violence tends to take on a life of its own with consequences unforeseen by anyone, but Sheehan-Dean's study effectively reminds us that deliberate decisions made by the human actors in the drama are at least as important in shaping that violence, and likely more so. 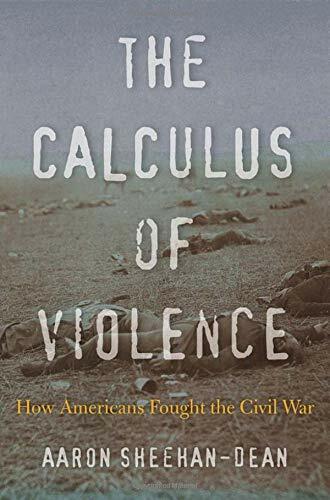 As terrible as the reality of the American Civil War was to both civilians and combatants, The Calculus of Violence shows that the conflict held great potential to in many ways become far more devastating. 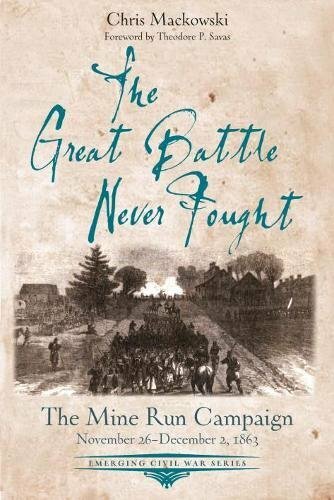 • The Great Battle Never Fought: The Mine Run Campaign, November 26 – December 2, 1863 by Chris Mackowski (Savas Beatie, 2018). 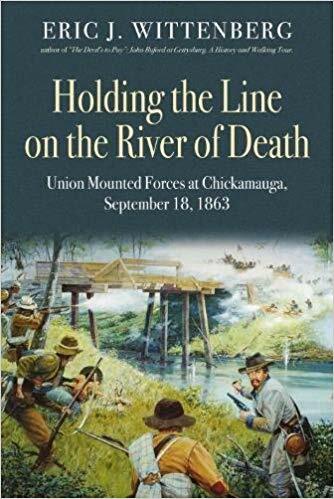 Though Jeff Hunt's planned trilogy bridging the gap between the Gettysburg and Overland campaigns will eventually cover it, the Mine Run Campaign portion of that period hasn't received a major standalone study since Graham & Skoch's 1987 treatment for the H.E. Howard series [Mine Run: A Campaign of Lost Opportunities, October 21, 1863-May 1, 1864]. Mine Run has received recent atlas coverage from Bradley Gottfried, and with Chris Mackowski's new book The Great Battle Never Fought the Emerging Civil War series of handy overviews has now addressed both of the autumn 1863 Meade vs. Lee campaigns in Virginia. Widespread gratefulness and appreciation for the great victory at Gettysburg was quickly replaced by harsh criticism of Meade's generalship over the ensuing months when he proved unable to force Lee into a decisive battle on the enemy's home ground. From the description: "Smaller victories, like those at Bristoe Station and Rappahannock Station, did little to quell the growing clamor—particularly because out west, in Chattanooga, another Union general, Ulysses S. Grant, was once again reversing Federal misfortunes. Meade needed a comparable victory in the east. And so, on Thanksgiving Day, 1863, the Army of the Potomac rumbled into motion once more, intent on trying again to bring about the great battle that would end the war. The Great Battle Never Fought: The Mine Run Campaign, November 26-December 2 1863 recounts the final chapter of the forgotten fall of 1863—when George Gordon Meade made one final attempt to save the Union and, in doing so, save himself." The volume exhibits the typical presentation of the series, with a profusion of maps, photographs, and period artwork illustrations. Publisher Ted Savas's afterword explores his role in rediscovering and preserving the Payne's Farm battlefield, the fighting on that ground being a major focus of Mackowski's narrative. There is a detailed 10-stop driving tour, which also incorporates the 11-stop Payne's Farm walking trail. In addition to that there are two appendices. The first traces the origins of the Culpeper National Cemetery and the second looks at the high command reorganization of the Army of the Potomac that took place prior to the beginning of the 1864 campaign season. After General Beauregard evacuated Corinth at the end of May 1862 and took the unauthorized health leave that led to his dismissal, the Confederate high command and general military situation in the West was in such disarray that there were fears of the front's imminent collapse. However, Braxton Bragg's elevation to command and his aggressive offensive movements turned western momentum on its head. Although his bold campaign into Kentucky failed to achieve satisfactory results, the western theater as a whole stabilized and the Confederates regained a strong military presence in Middle Tennessee. As much as it pains me to say that anything published in the 1990s can feel dated already, given the significance of the 1862 Kentucky Campaign it's surprising that no new single-volume campaign history has emerged to replace James Lee McDonough's War in Kentucky: From Shiloh to Perryville (1994). Before he passed, Kenneth Hafendorfer completed and published a two-volume military history of the Kentucky Campaign. Unfortunately, I could find no good information online about it beyond his daughter's efforts to sell the set online [here] at a price too rich for my blood. 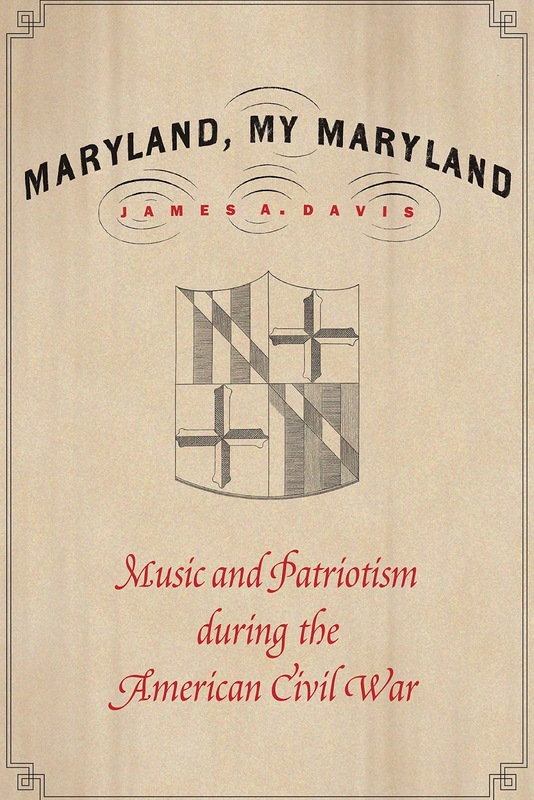 Presumably, the books serve as something of the physician-historian's magnus opus, incorporating his extensive previous work on Perryville, Richmond, and Confederate mounted operations into a fully realized campaign narrative. 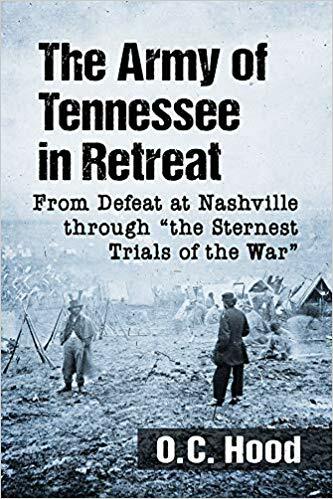 But getting to the news matter at hand, one of the upcoming volumes from UT Press's excellent Command Decisions in America’s Civil War series will address the campaign. Along with the Spruills, Lawrence Peterson is already a veteran of the format and his Decisions of the 1862 Kentucky Campaign: The Twenty-Seven Critical Decisions That Defined the Operation is currently scheduled for a May 2019 publication date. The series is well established at this point, but it's pretty clear that some campaigns are better fits than others in terms of supplying large numbers of strategic and operational level decisions conducive to intriguing analysis and discussion. I believe that that 1862 Kentucky Campaign would be one of the better candidates and I'm looking forward to seeing Peterson's treatment. • All Because of a Mormon Cow: Historical Accounts of the Grattan Massacre, 1854–1855 edited by John D. McDermott, R. Eli Paul, and Sandra J. Lowry (OU Press, 2018). So many U.S.-Indian conflicts arose from small incidents that quickly escalated into tragic open warfare. In August 1854, near Fort Laramie, a Lakota man was accused of killing a cow belonging to a Mormon emigrant. On the 19th, Lt. John Grattan and thirty men (twenty-nine soldiers and a civilian interpreter) arrived at the Indian camp to make the arrest. Tensions boiled over during the encounter, and the soldiers fired into the camp, killing a chief. In response, the angry Lakota turned on Grattan's command and massacred them. This incident sparked the First Sioux War, which lasted until 1856. Indecisive in its results, peace between the sides would be only temporary, and much larger and bloodier conflicts would follow. 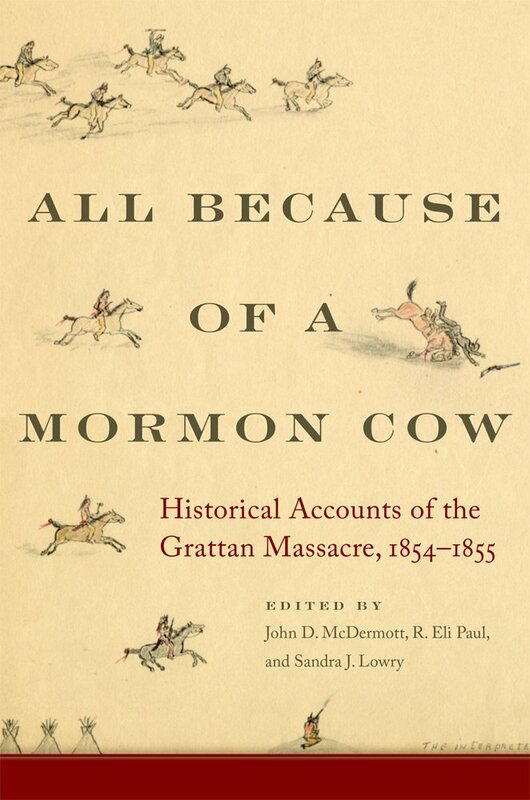 In All Because of a Mormon Cow: Historical Accounts of the Grattan Massacre, 1854–1855, editors John McDermott, Eli Paul, and Sandra Lowry bring together "all known contemporary accounts of the Grattan fight and its immediate aftermath" (xii). From the description: "Where previous accounts of the Grattan Massacre have made do with limited primary sources, this volume includes eighty contemporary, annotated accounts of the fight and its aftermath, many newly discovered or recovered from obscurity. Recorded when the events were fresh in their narrators’ memories, these documents bring a sense of immediacy to a story more than a century and a half old. Alongside the voices heard here—of the Indian leaders Little Thunder and Big Partisan, of Mormons from passing emigrant trains, and of government officials charged with investigating the massacre, among many others—the editors include a substantial and thorough introduction that underscores the significance of the Grattan Massacre in all its depth and detail." According to the editors, the accounts of the Lakota leaders mentioned above have never been published before in their entirety, and prior studies have overlooked many of the valuable firsthand writings from Mormon emigrants that can be found in this collection. Among the Grattan Massacre perspectives anthologized in the book are those from military officers, traders, emigrants, civilian travelers, Indian leaders, an interpreter, and a mail carrier. Arranged in chronological order, each account is preceded by editorial commentary. The book's introduction also contains a fairly lengthy, scholarly overview of the incident itself. All Because of a Mormon Cow is the first of two planned volumes. Spanning many postwar decades, the second book will contain later accounts of the massacre, both "reminiscent and reflective." In evaluating the different character of retrospective accounts written long after the incident in question, the upcoming volume will also look closely at "the nature of oral history and Indian testimony, their strengths and weaknesses, and the mechanisms for recording and remembering the Plains Indian Wars" (xiii). • Ironclad Captains of the Civil War by Myron J. Smith, Jr. (McFarland, 2018). With now nine thick tomes under his belt documenting the naval men, machines, and their operations along the western waterways, Myron Smith certainly ranks among the most knowledgeable and accomplished historians of the Civil War's brown water navies. 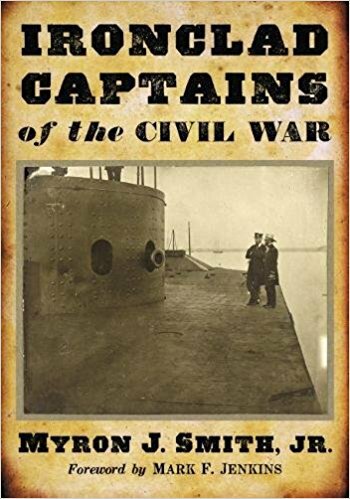 His newest book, and second biographical reference guide to his credit (the other being Civil War Biographies from the Western Waters), is Ironclad Captains of the Civil War. From the description: "Based on the Official Records, biographical works, ship and operations histories, newspapers and other sources, this book chronicles the lives of 158 ironclad captains, North and South, who were charged with outfitting and commanding these then revolutionary vessels in combat. Each biography includes (where known) birth and death information, pre- and post-war career, and details about ships served upon or commanded." Images of most (if not all) officers are included, as are many photographs of the vessels they commanded. Military and civil strife in the Rio Grande River Valley during 1861-65 have been explored in a number of useful books from historians Jerry Thompson, Stephen Townsend, Stephen Dupree, Michael Collins, James Irby, and others. The most recent works have placed more emphasis on the transnational and cross-cultural aspects of the border region's involvement in the Civil War, with analysis often extending both long before and well after the war years. The newest entry in the historiography, The Civil War on the Rio Grande, 1846–1876 (TAMU Press, Jan 2019), agrees with its predecessors that "(t)o understand the American Civil War in Texas also requires an understanding of the history of Mexico." Edited by Christopher L. Miller, Roseann Bacha-Garza, and Russell K. Skowronek, the book "focuses on the region’s forced annexation from Mexico in 1848 through the Civil War and Reconstruction. In a very real sense, the Lower Rio Grande Valley was a microcosm not only of the United States but also of increasing globalization as revealed by the intersections of races, cultures, economic forces, historical dynamics, and individual destinies." Miller, Bacha-Garza, and Skowronek are also the authors of Blue and Gray on the Border: The Rio Grande Valley Civil War Trail, which should be released any day now by the same publisher. It's advertised as "a densely illustrated travel guide featuring important historical and military sites of the Civil War period." A close companion to that guidebook, The Civil War on the Rio Grande "provides the scholarly backbone to a larger public history project exploring three decades of ethnic conflict, shifting international alliances, and competing economic proxies at the border." I'm looking forward to reading and reviewing both titles. by Nina Silber (UNC Press, 2018). From the description: "The New Deal era witnessed a surprising surge in popular engagement with the history and memory of the Civil War era. From the omnipresent book and film Gone with the Wind and the scores of popular theater productions to Aaron Copeland's "A Lincoln Portrait," it was hard to miss America's fascination with the war in the 1930s and 1940s." 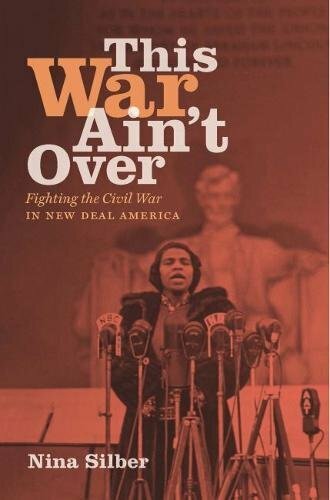 Nina Silber's This War Ain't Over: Fighting the Civil War in New Deal America "deftly examines the often conflicting and politically contentious ways in which Americans remembered the Civil War era during the years of the Depression, the New Deal, and World War II. In doing so, she reveals how the debates and events of that earlier period resonated so profoundly with New Deal rhetoric about state power, emerging civil rights activism, labor organizing and trade unionism, and popular culture in wartime." More: "At the heart of this book is an examination of how historical memory offers people a means of understanding and defining themselves in the present. Silber reveals how, during a moment of enormous national turmoil, the events and personages of the Civil War provided a framework for reassessing national identity, class conflict, and racial and ethnic division." The book suggests that the New Deal period was the "the first time Civil War memory loomed so large for the nation as a whole." To mask his bold amphibious landing of the main army below Vicksburg, General U.S. Grant ordered a number of diversionary operations over a wide geographical area. Conducted across from and above Vicksburg as well as in North Mississippi, all played important roles and were successful beyond expectation. The most famous and most substantial of these movements was Col. Benjamin Grierson's cavalry raid down the length of Confederate Mississippi. Launched from LaGrange, Tennessee on April 17 and concluding two weeks later at Baton Rouge, Louisiana on May 2, Grierson's Raid damaged enemy railroad tracks and destroyed trains and depot facilities, but its most telling feature was the mass confusion sown in the rear of General John C. Pemberton's Vicksburg defenders, who were concentrated along the east bank of the Mississippi. With Confederate attention temporarily reoriented to the east, the raid helped open a critical time window for Grant's army to land on the Mississippi shore unopposed and consolidate a bridgehead. Grierson's Raid has been examined in a number of magazine articles, essays, and book-length secondary works over the years. Ed Bearss detailed the operation in his Vicksburg Campaign trilogy and the raid has also been covered more recently in a pair of short works—Tom Lalicki's Grierson's Raid: A Daring Cavalry Strike Through the Heart of the Confederacy (2004) and Roughshod Through Dixie: Grierson’s Raid 1863 (2010) by Mark Lardas. The most popularly known (and oldest) treatment is Dee Brown's Grierson's Raid, which hasn't aged well since its 1954 release and in reality never upheld scholarly standards in the first place. 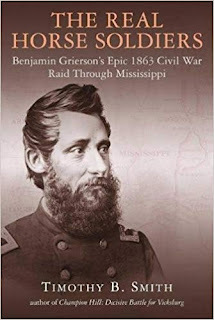 Happily, military historian Timothy Smith's The Real Horse Soldiers: Benjamin Grierson’s Epic 1863 Civil War Raid Through Mississippi fulfills the need for a full-length study that meets the demands of modern scholarship. In some ways, former music teacher Benjamin Grierson was a curious choice to lead the brigade-sized raiding force that consisted of the 6th Illinois, 7th Illinois, and 2nd Iowa cavalry regiments with an attached battery. Prior to the 1863 raid that made him instantly famous, Grierson was a relatively quiet wartime figure who only distinguished himself in a series of minor cavalry actions at the head of the 6th Illinois, none of which approached the scale, complexity, importance, length, and danger of the great Mississippi mounted operation. It seems he was selected primarily on the basis that no other immediately available cavalry officer was trusted as much as Grierson was by both generals Grant and Stephen A. Hurlbut, the latter a corps commander in Grant's army and head of the Memphis district of occupation. Exactly why this was so isn't entirely clear. Grierson would certainly repay with interest the confidence placed in him by his superiors. The book documents well the above mentioned diversionary expeditions, all of which served Grant's purposes but also immeasurably eased the initial passage of Grierson himself. As Smith shows, the two small movements from Memphis combined with a larger operation east out of Corinth opened a gaping hole in the already thin Confederate defenses of North Mississippi, an open doorway that Grierson was perfectly positioned to exploit. That the raiders were able to penetrate deep into Mississippi with no significant resistance demonstrated to all that the state's defensive arrangements lacked any real depth. Smith's minutely detailed narrative, which follows the course of the raid on a day-by-day basis, really gets to the heart of what made Grierson such an effective cavalry raider. He moved fast and employed active deception and diversion to great effect. Even though most civilian residents along the raid route felt themselves far from the fighting front and did not expect to see enemy soldiers of any kind, it still remains rather impressive that Grierson was able to convince so many Mississippians in so many places that his men were Confederate cavalry. He also availed himself of the services of many friendly residents and guides as he passed through counties with sizable pro-Union populations, and their contributions to his success should not be underestimated. Over an exhausting two-week period, Grierson also was able to consistently keep a clear head when confronted with a series of very stressful and fluid situations. With enemy forces finally closing in with dangerous numbers after he damaged the vital rail link between Vicksburg and Meridian, his flexible state of mind constantly weighed the benefits vs. risks of all possible escape options. These options ranged from (1) swinging back north (the preferred route of General Hurlbut, who feared losing his best cavalry to another district command) to (2) moving southwest to link up with Grant near the Mississippi River to (3) continuing directly south to shelter within Union lines at Baton Rouge. Recognizing that returning to Tennessee was by far the most dangerous option (especially for tired men and horses) and meeting up safely with Grant would have required exceptional timing that was deemed too risky, Grierson's choice to head for Baton Rouge was likely the most logical option, even though it had dangers of its own due to the heavy presence of Confederate troops at Port Hudson. In addition to the main force constantly feinting in different directions to confuse any pursuers, Grierson also sent out a constant parade of detachments varying in size from individuals to an entire regiment (Edward Hatch's 2nd Iowa Cavalry). Either looping back to the main force or returning all the way back to friendly lines in Tennessee, all of these actions (in addition to hitting ancillary infrastructure targets) helped keep the Confederates in the dark as to the location and intentions of the main body of Union raiders at any given moment. Smith properly praises the leadership shown by the officers that led Grierson's detachments, all of whom did their jobs to near perfection and at great risk to themselves. Fortunately for all involved, casualties were also light to non-existent. Clearly, Grierson was aided by an ineffectual Confederate response, which consisted primarily of hastily raised state troops and small regular detachments, none of which managed to strike Grierson (or any of his detachments) with enough strength or surprise to seriously endanger the mission. In assessing the response, Smith is more charitable toward Pemberton than most other writers have been, his critique taking into account the full range of the Confederate commander's responsibilities at the moment and the limited resources (particularly in mounted troops, which were necessarily concentrated in the north) available. Even so, the net was tightening considerably by the time Grierson reached southern Mississippi, and safe haven in Union-controlled Louisiana proved to be an invaluable 'get out of jail free' card. The raid was impressive by any measure, but Grierson clearly benefited immensely from the fact that he and his men did not have to return to their original starting point in the face of mounting opposition. It is popularly repeated in the literature that Grierson's Raid drew upwards of 20,000 Confederate soldiers or all types to the interior (away from the Mississippi River border counties) and afforded Grant a critical five-day window in which to land his army and consolidate his beachhead. Smith confirms the last point, but the former contention is left underdeveloped and only mentioned in passing. It's a long-held claim that probably deserved a fresh reappraisal in the book. Many readers will readily recognize the cinematic/literary origins of the book's title. Neither John Ford's The Horse Soldiers (1959) nor the Harold Sinclair novel of the same name that spawned the movie are discussed at any length in Smith's study; however, this represents no great missed opportunity as the intersection of history, novel, and movie has already been thoroughly examined by Neal Longley York in his 2001 book Fiction as Fact: "The Horse Soldiers" and Popular Memory. As one might anticipate given the past record of both author and publisher, The Real Horse Soldiers is well stocked with maps and illustrations. Also manifest in Smith's prior scholarship is deep research into primary sources, and this expectation is also met here in full. This exhaustive and engrossing study is the history of Grierson's Raid that's been long overdue. It is as notable a contribution to the wider Civil War cavalry literature as it is a newly essential component of the Vicksburg Campaign bookshelf. Highly recommended. • Visual Antietam Vol. 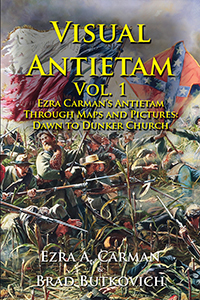 1: Ezra Carman’s Antietam Through Maps and Pictures: Dawn to Dunker Church by Ezra Carman, ed. and illus. by Brad Butkovich (Historic Imagination, 2018). Only recently published, Ezra Carman's Antietam manuscript is one of the most celebrated accounts of any Civil War battle written by a participant. Carman, who led the 13th New Jersey (Gordon's Brigade/Williams's Division/ Twelfth Corps) as its colonel during the 1862 Maryland Campaign, solicited accounts of the battle from both Union and Confederate veterans and created an extensive history of the battle that holds up well to this day. Brad Butkovich's Visual Antietam series (a planned three volumes) publishes the Carman manuscript again, but while others have focused on extensive annotation of the document itself this time the greatest emphasis is placed on creating visual reader aids (maps and photographs) directly tied to Carman's writing. Visual Antietam Vol. 1: Ezra Carman’s Antietam Through Maps and Pictures: Dawn to Dunker Church "contains sixty-three (63) images, both period and modern, allowing the reader to see the battlefield today and as it was only days after the battle. Twenty-six (26) original maps intricately detail troop movements that fateful morning." Covering the initial phases of the battle, the maps consist of highly detailed renderings of the natural and built landscapes upon which the small-scale troop movements and positions of both sides are dutifully traced. If you're unfamiliar with the author, I've discussed some of Butkovich's earlier work (see links here) where he's displayed considerable mapmaking and history writing talents. 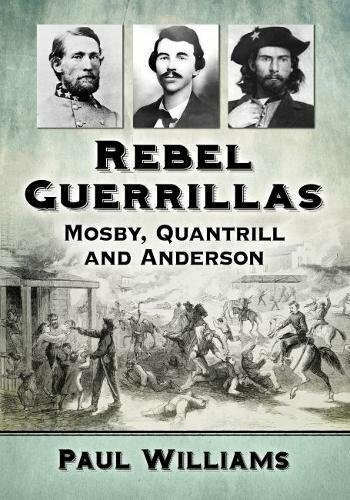 • Rebel Guerrillas: Mosby, Quantrill and Anderson by Paul Williams (McFarland, 2018). The publisher's description for Rebel Guerrillas: Mosby, Quantrill and Anderson only broadly hints at what interpretive slant(s) might be taken in the book: "From the hills and valleys of the eastern Confederate states to the sun-drenched plains of Missouri and "Bleeding Kansas," a vicious, clandestine war was fought behind the big-battle clashes of the American Civil War. In the east, John Singleton Mosby became renowned for the daring hit-and-run tactics of his rebel horsemen. Here a relatively civilized war was fought; women and children usually left with a roof over their heads. But along the Kansas-Missouri border it was a far more brutal clash; no quarter given. William Clarke Quantrill and William "Bloody Bill" Anderson became notorious for their savagery." The short prologue is similarly Booknotes-unfriendly in terms of giving me little in the way of a clear layout of the book's overall intentions, though it does offer perhaps some insight into what author Paul Williams plans to do with a trio of already well-documented irregular war figures. With John Singleton Mosby the ideally realized product of what the Confederacy's Partisan Ranger Act of 1862 intended to create, it seems the book will contrast the Virginian's actions with those of notorious Missouri bushwhackers William C. Quantrill and William T. "Bloody Bill" Anderson. It appears the study might also attempt to delineate some essential East vs. West differences in the character of the Civil War's irregular component, though one hopes the author doesn't go too far with drawing radical distinctions given that various savage forms of guerrilla warfare existed across all fronts. With Quantrill and Anderson being the same brand of fighter, it is a bit curious to include both men in what is presumably a three-way comparative study. by Amy Murrell Taylor (UNC Press, 2018). Long before the Emancipation Proclamation went into effect, wherever Union armies and navies went in the southern and border states slavery was put on the practical path to extinction. During the war years, an estimated 500,000 enslaved persons took the opportunity that nearby military operations afforded them to flee to Union lines for freedom and protection. Similar to what happened to the medical services when confronted and overwhelmed with the realities of camp sicknesses and the mass casualties of the battlefield, the military authorities tasked with running refugee camps were ill-prepared to house and care for the mass of humanity. Lack of resources, the inherent limitations of mid-nineteenth century medical knowledge, and sometimes neglect often meant that the camps that were set up to shelter ex-slaves became rife with disease and death. But the camps were certainly more than that to all involved, and Amy Murrell Taylor's Embattled Freedom: Journeys through the Civil War’s Slave Refugee Camps examines the full breadth of the refugee camp experience and the meaning those places had to their inhabitants and their aspirations for more permanent freedom. 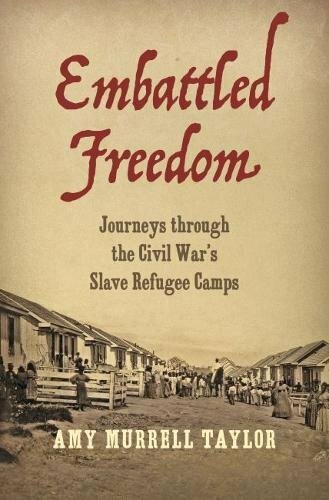 From the description: "Drawing on an extraordinary survey of slave refugee camps throughout the country, Embattled Freedom reveals as never before the everyday experiences of these refugees from slavery as they made their way through the vast landscape of army-supervised camps that emerged during the war. Amy Murrell Taylor vividly reconstructs the human world of wartime emancipation, taking readers inside military-issued tents and makeshift towns, through commissary warehouses and active combat, and into the realities of individuals and families struggling to survive physically as well as spiritually. Narrating their journeys in and out of the confines of the camps, Taylor shows in often gripping detail how the most basic necessities of life were elemental to a former slave's quest for freedom and full citizenship." The author integrates a multitude of personal histories into her narrative. "The stories of individuals--storekeepers, a laundress, and a minister among them--anchor this ambitious and wide-ranging history and demonstrate with new clarity how contingent the slaves' pursuit of freedom was on the rhythms and culture of military life. Taylor brings new insight into the enormous risks taken by formerly enslaved people to find freedom in the midst of the nation's most destructive war." At this point, the question of why men enlisted in the Union Army has been studied in innumerable books and articles. Among the many motivational factors raised and explored in this large body of scholarship are patriotic fervor, sense of duty, principles of masculine honor, ideology (be it antislavery or just pro-Union), hope for social advancement, religious conviction, or even just sheer boredom and desire for grand adventure. Absent in most of these discussions of early-war volunteerism is the economic incentive, which few soldiers readily admitted to in direct fashion either at the time or in retrospect. However, historian William Marvel believes money to have been a significant inducement at every stage of the conflict, even in its earliest months. 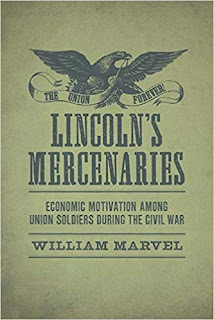 In his new book Lincoln's Mercenaries: Economic Motivation Among Union Soldiers During the Civil War Marvel offers the first comprehensive examination of how a lingering downturn in the northern farm and industrial economies (which began during the Panic of 1857 and didn't have an opportunity to recover before being hit anew with the secession crisis's currency, commerce, and trade disruptions) led legions of northern men in 1861-62 to see the volunteer army as the only way to adequately support themselves and their families. In addressing the 1863-65 period, the study confirms some long-held popular and scholarly views on bounty incentives while also proposing fresh perspectives on late-war volunteerism. Before now, the absence of useful statistical data regarding the financial situations of recruits and their families has severely limited research. Marvel cites the recent availability of median income data from the 1860 census, made possible by the University of Minnesota's Integrated Public Use Microdata Series (IPUMS), as the research tool most indispensable to his study. Previous historians had only anecdotal primary sources and average wealth numbers to rely upon, the latter obviously too skewed by income extremes to be truly valuable. Access to state by state median income figures allowed the author to divide recruits into equally sized study groups. Lest anyone get too carried away with the "rich man's war, poor man's fight" aspects of Marvel's interpretation, the author firmly reminds the reader that recruits with incomes below the median were not necessarily poor (or part of the lowest social class). With that in mind, however, the median income dividing point does for the first time allow meaningful (albeit imperfect) large-scale analysis based on economic class. On the face of it, it seems quite reasonable for past historians to have viewed the eager response to Lincoln's post-Sumter call for 75,000 militia to put down the rebellion as the war's most fervent expression of northern patriotism. This is certainly part of the story, but Marvel's research also finds that 71% of northern 90-day militia volunteers were men with below-median incomes and attributes this heavy overrepresentation to the dire economic conditions that existed in early 1861 and the vast available pool of unemployed men of military age. This 71% figure is higher than any of the other major recruitment drives examined in the book [the 3-year volunteers of 1861 (the next closest at 70%), 3-year 1862, 9-month militia 1862, 3-year 1863-64 (also 70%), 100-days 1864, and 1-year 1864-65]. While no one reasonably expects to encounter even distribution by income under any circumstances, an observer could be forgiven for anticipating the economic class disparity among the first 90-day volunteers to rank among the lowest of any group, especially if one believes (as Marvel does) that patriotic feeling was more or less evenly distributed during the initial war fever period. This counterintuitive result suggests a disproportionately compelling economic incentive. Even though the war economy might have been expected to pick up at a time coinciding with the mustering out of the 90-day regiments, Marvel perceptively notes that the extended prewar economic downturn had created surpluses in enough key industries (an important factor in combination with continued currency shortages, trade embargoes, and crop failures) to still make military service attractive on its own. This delay in the wide-scale emergence of competing employment opportunities in the civilian sphere allowed authorities to maintain comparatively low monetary incentives (monthly army pay plus state and local bounties plus monthly family support payments) for the first wave of 3-year volunteer regiments in summer 1861. As other historians have pointed out, communal generosity in the form of military family stipends dried up relatively quickly in the face of an extended war and promises of support were widely reneged upon. By the time Secretary of War Edwin Stanton unwisely suspended recruitment all across the country in April 1862, the revitalized war economy was already attracting workers in large numbers. Thus when the call for new troops resumed that summer the response was tepid, requiring much larger bounties to convince men already accustomed to reading frightening casualty lists in the newspaper, and who now had more and better employment options than they did in 1861, to volunteer. Confusion over the threat of conscription also had some effect in spurring enlistment. With much higher monetary rewards attached to enlistment for this period, many 1861 volunteers understandably seethed at the lavish (as they saw it) generosity bestowed upon the later volunteers, and their anger was redoubled when they learned it would be taxes on their own property that would help pay for the bounties. As it was in 1861, sizable majorities (typically percentages in the low 60s) of the volunteers that filled the ranks of 1862's three-year regiments came from the poorer side of their state's median income. A notable exception was Iowa, which had very nearly equal representation. Concurrent with the new three-year regiment recruitment drive of mid-1862 were the 9-month militia regiments, which unlike the former did carry the conscription threat if left unfilled. According to Marvel's research, the militia regiments did not have the same financial inducements but had other obvious benefits of their own. In most states, enlistee rates for those above the median income were decidedly higher in the short-term militia regiments than the three-year formations. The late-war "bounty men" are those most commonly disparaged then and now, but Marvel finds that even the 1862 volunteers were widely jeered in the army for being latecomers with pockets filled more with money than heads with patriotism. When the first implementation of conscription arrived in March 1863, after liberal draft exemptions and substitute-commutation payments no state exceeded 5% enrollment (and most far less). Even less than that actually entered the ranks in the field. In Marvel's view this is more clear evidence that financial incentives, combined with the draft threat, were required to get any serious number of men into the ranks by the mid-war period. The recruitment pattern of the 1864 100-day regiments further confirms Marvel's thesis that the higher-than-median income recruits were concentrated in the short-term regiments. Indeed, for some states the roughly two-thirds representation of less-than-median income recruits in their long-term regiments almost exactly matched the representation of higher-than-median recruits in their short-term regiments. Marvel well recognizes the fact that multiple sources of motivation existed in most individuals and it would be utterly impossible for anyone today to establish a clear-cut hierarchy of motivations with any degree of certitude. Really, most of the men themselves probably could not have honestly done it at the time. It is a common refrain among Civil War researchers that so much primary source material exists that one can anecdotally support a whole range of conclusions associated with almost any issue. That said, Marvel's extensive manuscript research nevertheless powers the creation of an intellectually compelling assembly of individual vignettes supported by personal writings that together lend credence to his thesis. Thickly and evenly spread throughout the chapter-length discussions of the public response to each national appeal for volunteers, the collective thrust of these individual testimonials and vignettes (in combination with the supporting quantitative data presented) suggests a widespread impact of economic incentives. Even though the vast majority of new volunteers understandably avoided any kind of direct admission of money being the primary or sole inducement for joining the army or navy, financial matters and concerns very often dominated their early letters home. Marvel readily admits that many readers will object to his chosen title of "Lincoln's Mercenaries" as overly burdened with negative connotations, but defends his use of the term "mercenary" as being a selective yet technically appropriate usage of the dictionary definition. Even so, it still seems rather needlessly provocative in the sense that some otherwise reasonable readers might dismiss the book on the title alone or begin reading this important study with a mind less open than it might have been with a different title. Marvel makes clear repeatedly throughout the book that he does not want to create the impression that he's impugning the patriotism of northern soldiers, but this doesn't help. In persuasively challenging the traditional interpretation of enlistment motives among the 1861-62 recruiting classes as being primarily ideological in nature, Marvel's book is force to be reckoned with in future studies. The author does not seek to elevate money as the top reason that men went into the ranks of the Union Army, only that the strength of economic incentives has been misunderstood and vastly underappreciated by nearly all historians that have studied early Civil War volunteerism. His arguments in this regard are very powerful.